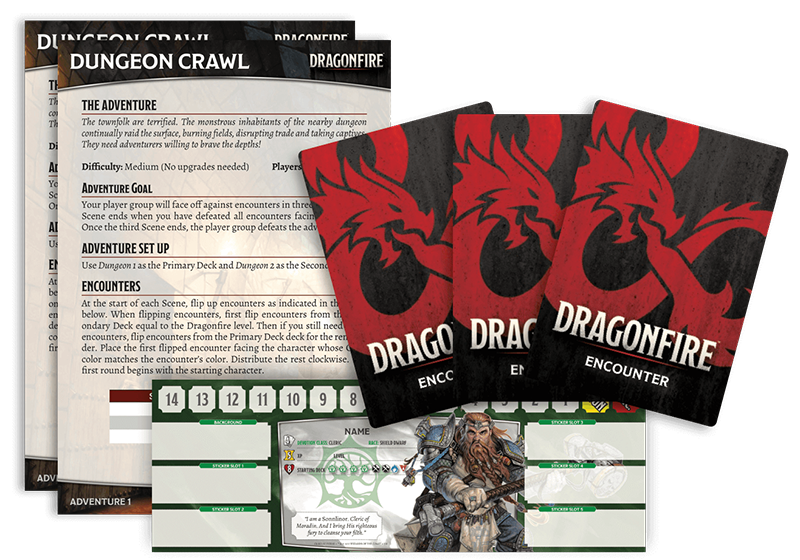 Dragonfire is a 3 to 6 player deckbuilding game set within the world's greatest roleplaying game, Dungeons & Dragons. Players choose from several classic fantasy races, from dwarf to elf, half-orc to human, and assume one of the quintessential roles of cleric, rogue, fighter, or wizard. Equipped with weapons, spells, and magic items, players begin their adventure along the famed Sword Coast, then journey to other Forgotten Realms locales, such as Baldur’s Gate, Neverwinter, and Waterdeep, in future expansions. Along the way, they can level up their characters, find additional equipment, learn new feats, and much more. A deckbuilder game starts each player with a small deck. Then, during the game, players acquire cards—usually from a large, common selection—that build their deck during play. This provides a dynamic, changing style that makes each game experience new. Catalyst Game Labs is dedicated to producing high-quality games and fiction that mesh sophisticated game mechanics with dynamic universes—all presented in a form that allows beginning players and long-time veterans to easily jump into our games and fiction readers to enjoy our stories even if they don’t know the games.